Peplums are one of my favorite trends of recent. I think they're fun, quirky, and so easy for work or play. Peplums tend to be quite fitted with a kick of flare. Today we're looking at a more relaxed version. 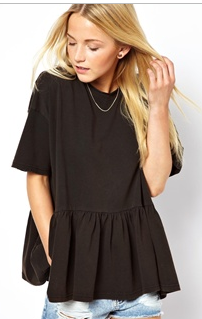 An oversized peplum. Relaxed but still pretty. I can work with that. This shirt would look frumpy except the chiffon makes it cool. I love this top. It's so effortless. I would just layer on the girly and blingy accessories. 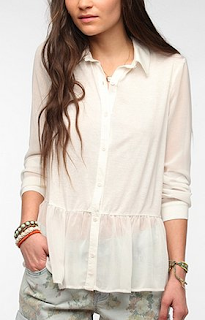 This beautiful top also comes in purple. The simple pleat keeps everything in line. Peplums are still all the rage but they don't always have to be so prim and proper. Try something out of the box, a little cooler, a little more effortless. Get loose.